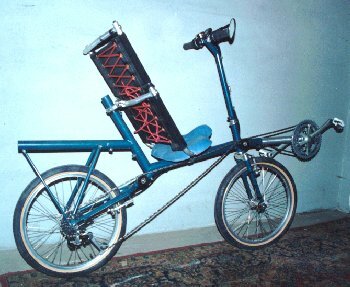 I started building recumbent bicycles, as a hobby, around 1989. I like short wheelbase recumbents (SWB) and most of my designs are of this configuration. With age I've become more interested in power assist for my bikes. These efforts are also documented. Here are some of my more notable efforts. First SWB My first SWB recumbent bicycle built in time for the IHPVA races in Portland, Oregon 1990. Second SWB These bikes built for my wife and I were my first collapsible versions. We used these on our trip from Washington to Ohio in 1994. Third SWB These are our current bikes. They also collapse for travel. We've used them since our New Zealand trip in 1997. Power Assist In 1999 I built power assist units for our bikes. These consist of 22cc string trimmer motors to assist in hill climbing. The bikes built in 1997, with 1999 power assist, have served us very well. I've not completed new bikes since that time. I've had ideas for improving the power assist and toyed with the idea of building a couple of trikes. However, our current bikes work well enough that I've not pursued new ones. Maybe soon.